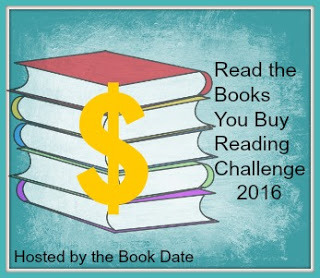 In a way, it's kind of strange to be signing up for both this challenge and the Mount TBR Reading Challenge. But Mount TBR has me chipping away at the mountain, while this challenge should help me keep the mountain from growing, so in a way they complement each other. From what I gather from my Goodreads shelves, I bought about 98 books in 2015 (seriously?! I felt like I was doing better than that...), and of those I read... 6. Yes, really. What's the point of buying books (especially new books) if I'm not going to read them any time soon? So, I will be joining this challenge at the level of Moderately Successful, meaning that I'll be aiming to read 40-60% of the books I buy in 2016. I'll list all the books I buy below, and strike them out as I read them. It's surprising how we think we are doing better at reading what we buy, although part of the fun is the choosing and buying! All the best for the challenge and thanks for joining in.